Single room rates available to book later in the booking process. *Save up to $300 through May 15th. Only 2 cabins left! *Save an additional $150 if making final payment by check! "Follow the Leader" options during free time - a BDA exclusive! Day 1: Sunday, June 30, 2019: WELCOME TO MADRID! • Arrivals throughout the morning and transfer to the hotel on own to store your luggage (arrive by 11am). • This afternoon, we enjoy a city tour of Madrid. We stop to see the Royal Palace, Puerta del Sol, the 17th century Plaza Mayor and other key sites as we learn about the city center's amazing and sometimes sordid history. • We return to our hotel to check in and refresh. • This evening, we come together for introductions and orientation at our hotel, followed by a delicious welcome dinner. • This morning, we stroll along Paseo del Prado and visit the famed Prado filled with European art from the 12th to early 20th centuries. • Next, we visit Mercado San Miguel, filled with foods of every variety. • After lunch, we visit Retiro Park, where we will find all kinds of interesting monuments and gardens, including the Jardin de Vivaces, the Rosaleda rose garden and the Parterrer Frances, which holds a Mexican conifer that is nearly 400 years old and is believed to be Madrid's oldest tree. •We stop for a glass of sangria at a local cafe. • One-night early arrival participants transfer to hotel on own, check in and meet the group for evening activities. • Tonight, enjoy a tapas-style dinner at a local restaurant, then be treated to a Flamenco dance show. • This morning, we depart Madrid and travel to Salamanca, a UNESCO World Heritage site in the center of Spain's Castilla y Leon region. • Upon arrival, we make a short stop for lunch on own and a chance to visit the elegant Roman Bridge originally constructed in the year 89. • Next, we view the historic buildings of the University of Salamanca, founded in 1134, as well as the Gothic cathedral that took over 200 years to build and is now nearly 300 years old. • We continue to Vega de Terrón to board our river ship and meet our fellow travelers before setting off on our journey along the Douro River. • This evening, we enjoy a welcome program and orientation, followed by dinner in the dining room aboard our ship. After breakfast aboard our ship, we venture to Castelo Rodrigo, known as the “White Village” because of its almond trees. The site offers spectacular views of the surrounding area. Join a walking tour through its medieval streets and see the houses and establishments with 16th-century facades and Manueline-style windows. If you prefer a more active adventure, you can hike up to the town. At the end of both tours, enjoy a tasting of local favorites, such as almonds, cheese, bread and wine. Later this afternoon, we set sail to Pinhão, where we will be treated to a wine tasting at charming Quinta do Seixo (or similar), followed by dinner aboard our ship this evening. We enjoy breakfast aboard our ship, then set out on an excursion to the palace and gardens known as the Palacio de Mateus, located in the beautiful region of Trás-os-Montes near the city of Vila Real. The interior of the house features various religious images and exquisite furniture, artwork and hand-carved wooden ceilings. The exterior is equally stunning, with gardens that are among the most beautiful in all of Portugal. During the afternoon, enjoy lunch at Quinta da Avessada. Here, we will enjoy an authentic and traditional dining experience complete with entertainment. Quinta de Avessada is also a fascinating interactive museum commemorating the history and culture of wine in the Alto Douro region, where you will have fun discovering all the various stages of wine production with plenty of tasting. We return to our ship later this afternoon for dinner and evening entertainment. We enjoy breakfast aboard our ship, then visit the ancient and picturesque Lamego, home to one of the most important pilgrimage sites in Portugal, the Nossa Senhora dos Remédios (Sanctuary of Our Lady of Remedies). Other attractions include the Gothic cathedral, a museum and charming cafes. Active adventurers can choose to hike up the famed Lamego Steps, also known as the Holy Staircase. Later this afternoon, we return to our ship for a relaxing evening and dinner together. We begin our day with breakfast aboard our ship, then set out on a morning trek through the vineyards. 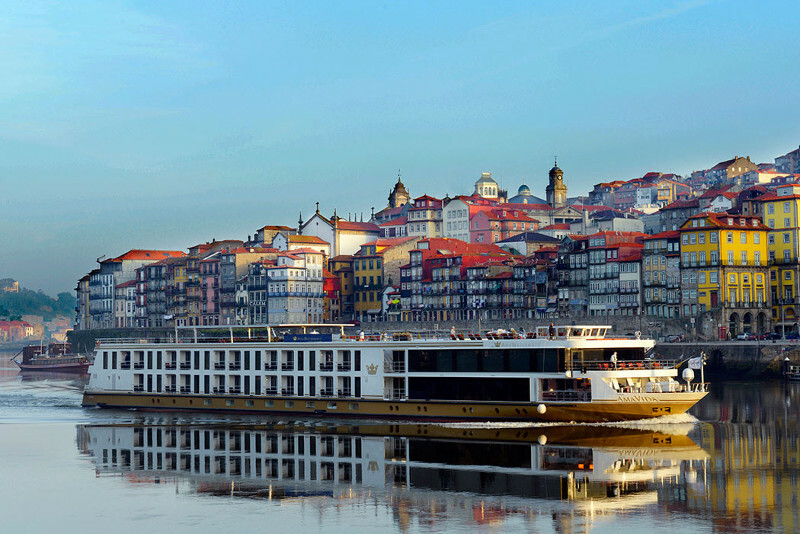 We set sail along the scenic Douro River and savor a pre-dinner glass of Vinho Verde wine from the terrace of the centuries-old Alpendurada Monastery, followed by a traditional home-cooked dinner before returning to our ship for the evening. Breakfast aboard our ship, followed by a guided tour of Porto's historic quarter, a UNESCO World Heritage site. Here, we will see the Cathedral, one of the city's oldest monuments, as well as the main square, ringed with shops and cafes. Next, we will visit the Sao Vento Railway Station, known for its blue and white tile panels depicting scenes from Portuguese history. This afternoon, we enjoy a tasting of Port, Portugal's most renowned contribution to the world of wine. For a more active adventure, join a hike in Porto and explore the old harbor quarter, passing through the medieval streets of Porto and indulge in a Port wine tasting. We return to our ship for dinner and an evening program. Breakfast aboard our ship. Today, enjoy a choice of excursion options to enjoy the surrounding areas of Porto. Option 1: Exploring Guimarães: Join us for a guided tour to Guimarães, one of the most historic towns in Portugal, a UNESCO World Heritage site and European Capital of Culture in 2012. The birthplace of Portugal's first king, Guimarães claims to be “the cradle of the nation” and boasts a historic center that is one of the most attractive and best preserved in all of Portugal (fee applies). Option 2: Guided Porto Bike Tour: A 3-hour easy and engaging guided tour along the beaches, parks, waterfront and historical landmarks of Porto. It is a safe and comfortable ride for anyone who is able to ride a bike (fee applies). Option 3: Seaside Walk: Choose to just take it easy on the last day of your cruise and meander on a seaside stroll along the Atlantic Ocean with a café stop in Alfurada. It's always the BEST DAY when we treat: Portuguese cuppa Joe on us! Tonight, we gather together one last time for a farewell cocktail party and dinner. Our ship moors in Porto overnight. • Breakfast aboard our ship. • Today, we disembark from our ship and transfer to the airport for our flights back to the United States. • We travel to Lisbon, Portugal's capital city. • We begin our day exploring the two central but vastly different districts of Baixa and Alfama. Baixa Pombalina is an elegant district primarly built after the 1755 Lisbon earthquake. We stroll along the boulevards and take in the beautiful Pombaline-style architecture. • We continue with a walking tour of Alfama, Lisbon's oldest quarter, crowned by the 12th century Castelo (castle) Sao Jorge. Here, we take in some of the most stunning views of Lisbon, and ride the Elevador Santa Justa lift, designed at the workshop of Eiffel (of tower fame). • We check into our hotel in the late afternoon and have time to relax. • Tonight, enjoy some free time on own or “follow the leader” to dinner and discover Lisbon's nightlife. • This morning, we enjoy an excursion to Serra de Sintra, one of the most picturesque mountain villages in all of Portugal, and a former summer residence of the Portuguese royal family. Sintra has been a source of inspiration for Lord Byron and generations of other artists and poets. The highlight of our morning will be a visit to the Pena National Palace, a fairytale castle situated high on a rocky peak. • We enjoy lunch on own and some free time in the foothills of this royal sanctuary before heading back to Lisbon. • Tonight, we enjoy time on own or “follow the leader” to dinner and discover Lisbon's nightlife. • Today, we hear the history of Jewish culture in this city. Our tour begins in the Juderia Grande (Large Jewish Quarter), established in the 13th century under King Dinis. • We visit Shaare Tikva, Lisbon's synagogue, which celebrated its 100th anniversary in 2002. We hear the history of Jewish culture in this city. It is believed that Jewish life began here not long before Lisbon fell to the Moors in the 8th century. • Next, we explore Rossio Square, where the National Theater stands upon the site of the Palace of Estaos, where during the Inquisition, many Jews were tortured and killed as “infidels”. The adjacent Square of Sao Domingo is the site of the Massacre of 1506 when more than 500 New Christians (Jews forced to convert) were tortured and killed. • Spend the afternoon at leisure to explore this stunning city on own and enjoy time for last-minute souvenir shopping. • Tonight, we join together for a special farewell dinner accompanied by live Fado music. A worldwide symbol of Portugal, Fado is a genre of traditional folkloric music that can be traced to the early 1800s. Melancholy by nature, the music includes instruments like guitars and mandolins with one Fadista singing poetically expressive lyrics. • Transfer to the airport on own throughout the day. Luxury Accommodations: All staterooms are spaciously appointed with plenty of amenities - most staterooms feature balconies that afford stunning views of the Spanish and Portuguese countryside. With only 51 staterooms on board, the luxury of space means that restaurants, lounges and outside decks are never overcrowded. Entertainment and Fun: Whether it's a folkloric performance, local Fado musicians or modern piano favorites, there is an eclectic schedule of entertainment on board throughout our journey. Culinary Delights: Regionally inspired, exquisite cuisine is expertly presented at a variety of dining venues for every meal. Relax and Enjoy: Soak up some rays or take a dip in the refreshing pool with a swim-up bar as we pass by centuries-old castles, charming villages and other breathtaking scenery excursions. Or, return to the ship and treat yourself to a bit of pampering with a soothing massage.